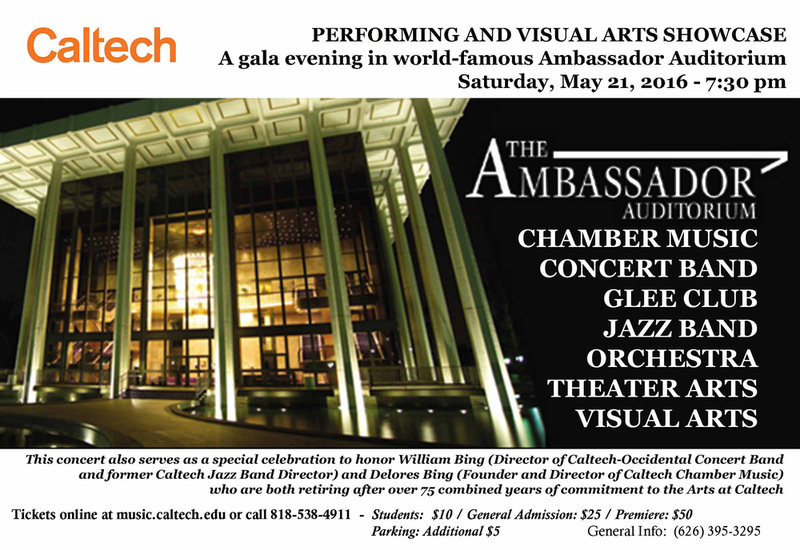 Caltech's music, theater, and studio arts programs combine to present a gala evening in Pasadena's world-famous Ambassador Auditorium. Caltech students and alumni will grace the stage of this state-of-the-art concert hall, once the site of performances by the likes of Luciano Pavarotti, Yo-Yo Ma, and Ella Fitzgerald. Chamber music, glee club, jazz band, orchestra, concert band, and theater performances will highlight the evening. A studio arts exhibition and small ensembles scattered throughout the venue will add to the festivities. This concert also serves as a special celebration to honor William Bing (Director of Caltech-Occidental Concert Band and former Caltech Jazz Band Director) and Delores Bing (Founder and Director of Caltech Chamber Music) who are both retiring after over 75 combined years of commitment to the arts at Caltech.